It’s blog circle time again, when I link up with creative women and their blogs from all over the world. This month we are all writing about out favorite quotes. Should be interesting! At the end of this post follow the link to the next blog in the circle. To name a favorite quote, I would probably say it would depend on the topic. But that is the challenge for this month’s blog circle…What is your favorite quote? I’m still going to “cheat” a bit and pick two. My kids and husband would tell you that I’ve always said it’s about the journey, not just the destination. That applied and still does to day to day life as well as the grand themes in life. Going on family vacations was just as much about the route we traveled to and from and what we would do and see along the way as it was about the place we were headed. It’s not surprising that one of the first Inner Aperture cards I designed included that quote. More than ever, we are inundated with images of our world. We can get immune to what’s around us because we think we’ve seen it all before. We run the risk of getting to a place where nothing surprises or delights us any more. We see a place or a person, and think, oh yeah, I know this. What I strive to do as an artist and photographer is capture subjects in ways we haven’t seen or noticed before and in so doing show others what else there is to see and experience if you just see with “new eyes”. I’ve had the pleasure of traveling to Switzerland quite a bit since we have family living there. I love to photograph that beautiful country. Two things could come into play if I didn’t constantly remember Proust’s words. First there is no limit to the amazing grand images of Switzerland and secondly, having been there quite a few times, it might be easy to think I (or someone else ) have already captured all there is. So given those two things, why bother? Because there is so much more if we just see with “new eyes” and that applies wherever you are. I don’t have a card with Proust’s words on it (hmm, perhaps I need to remedy that) but I thought I would share with you something I created on one of my first trips to Zurich, The Swiss Alphabet. It was a really fun exercise in slowing down and paying attention to details that normally would be overlooked, seeing with those “new eyes”. As you go about your days, working, playing, traveling, interacting with people, be it family, friends, or strangers, try to remember Proust’s words and have “new eyes”. This entry was posted in Seeing, Sharing and tagged Inner Aperture, Inspiration, Quotes, Switzerland on April 18, 2013 by gail. Today I am joining a blog circle comprised of some amazing, creative women from all over the world. In deference to February, we have chosen the topic of Love. Each blog post will be thoughts and musings on that same topic, each from the perspective of a different creative soul. How’s that for an uplifting way to spend a bit of time… traveling across the globe reading about love? Love is a pretty huge topic to tackle in so many ways. My thoughts are always more visual than verbal so I decided to express an aspect of love in that way. 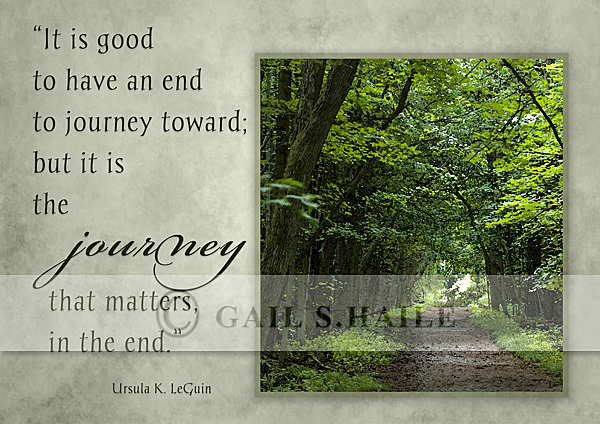 You may know that I have a collection of Inner Aperture note cards that feature carefully selected quotes and images whose purpose is to inspire, strengthen, uplift, center the receiver. For this post, I have designed a new Inner Aperture card that expresses my philosophy on our ability to share our love with the world. I’ve always felt that what we do day to day, minute by minute, right in our immediate surroundings with the people who are part of those moments has great potential to make a difference in the world. If each person were to slow down and do good, share love, right where they are, the world would, indeed, be a better place. Large acts of love, yes, are important but too often we dismiss and grossly undervalue how much a kind word, a smile, a gentle touch, can make a difference to someone. I chose to use this Lichen Mandala that I created a few weeks ago for Mandala Monday because it portrays a very ordinary, everyday thing, lichens on a tree. They are quite common and ordinary but exquisitely beautiful when you really look at the colors and the patterns. When transformed into a mandala, that beauty is multiplied and spreads off the edge of the mandala. 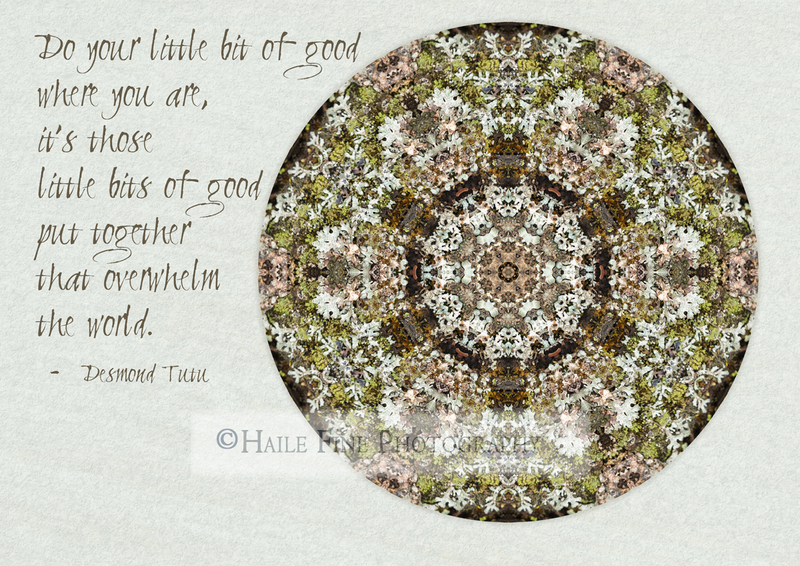 It seemed the perfect mandala, along with the wonderful quote from Desmond Tutu, to express how significant and, yet, so simple it can be for us to share our love with the world. To continue the blog circle, head over to Jean Wagner’s blog , A Change of Art. Enjoy your blog travels around the world and surround yourself and those around you with love! This entry was posted in Practicing, Seeing, Sharing and tagged Celebrate, Inner Aperture, Love, Mandalas, Nature on February 21, 2013 by gail. This entry was posted in Mandalas, Sharing and tagged Grief, Inner Aperture, Mr. Rogers on December 17, 2012 by gail. This is the new “child” in my family of fine art note cards called Inner Aperture. It often feels like these cards call to be born and that was the case with this one yesterday. I had much on my to do list, but the list sat forlornly on my desk while this card design slowly emerged. You may recognize the mandala from a Mandala Monday a few weeks ago. I liked the idea of the threads of thanks that continually reached out and multiplied. I wish for everyone, the world round, many reasons to give thanks and “happiness doubled by wonder”. Happy Thanksgiving! Click on the image to see it larger. If you’d like to share this with others, please do so by simply sharing the link to this blog page. This entry was posted in Celebrating, Mandalas and tagged Gratitude, Inner Aperture, Mandalas on November 21, 2012 by gail.